McAuley is among the 100 most common surnames in Ireland, if we include the many variations of the name: McCauley, MacAulay, McCawley, McGauley, McCowley, McColley, Macauley, Cawley, Magawley, McCooley, Gawley, etc. 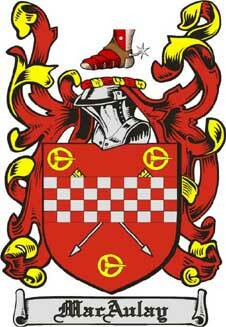 (2) in County Westmeath an important branch of the Southern O’Neill clan took the surname MacAwley. (3) Scottish settlers, most of whom settled in Ulster, especially County Antrim,are believed to account for the majority of McAuleys in Ireland. In addition, there is evidence of possible McCauley septs in Donegal, Sligo, and elsewhere. These septs were not well documented because of the chaotic history of Ireland during the late Middle Ages, but modern research is shedding light into these MacAuley ancestors. Since there were at least five McCauley clans (two Irish and three Scottish), and since most of their descendants have dispersed from the ancestral territories, it is extremely difficult for many McAulays to pinpoint their ancestral clan. Fortunately, DNA analysis technology can now help identify long-forgotten relationships, and the MacAulay Clan Society is coordinating a MacAulay DNA Study that will help MacAuleys find out which McCauley clan they are descended from. According to the 1901 Census of Ireland, there were 4,571 persons named McAuley, McCauley, McGauley, or one of the variant spellings. In addition, there were 1,266 persons in Ireland named Cawley or Cauley. But MacAuleys are not spread evenly throughout the island-- only six of the 32 counties had more than 100 McAuleys, accounting for over 90 percent of the total. 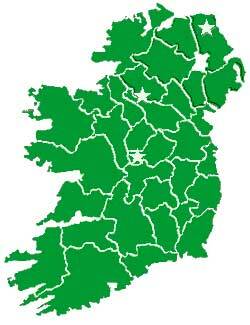 The six McCauley-rich counties are Antrim, Cavan, Donegal, Dublin, Down, and Fermanagh. The McAuleys of Dublin are believed to have come from other places in Ireland. The McCauleys in the other five McAuley-rich counties are probably the descendants of people who have lived in those counties for centuries. The McAuleys of Antrim and Down are probably mostly descended from Scotch-Irish (Ulster-Scot) settlers. The McCauleys of Fermanagh and Cavan mostly descend from the MacAuley sept of the Maguire clan. (The MacAulay DNA Study has confirmed this.) The large number of Donegal McCauleys are believed to are believed to be descended from one or more poorly-documented septs that existed in the late medieval period. County Westmeath had only 54 McAuleys in 1901, so it appears that most of the descendants of the medieval MacAmhalghaidh clan had dispersed. The best-known descendants of this clan, Mother Catherine McAuley and the Counts Magawley-Cerati, are evidence of this dispersal. Many, but not all, of the 1,266 Cawleys of Ireland are believed to be descended from McCauleys who dropped the "Mac" prefix. Some of these Cawleys were in the five McAuley-rich counties, but the largest concentrations are in Sligo and Mayo, and probably descend from poorly-documented septs. The barony of Clanawley in southern Fermanagh is the ancient homeland of this McAuley sept, which is descended from Awley Maguire (d. 1306) who was a younger son of Donn Carrach Maguire (d. 1302) the first Maguire ‘king’ of Fermanagh. It was during the lifetime of Awley and his sons that the Maguires spread from their stronghold in northeastern Fermanagh and crossed Loch Erne. Awley’s obituary cites him as “Chief of Muintir Pheodacain”, a district which was later renamed ‘Clanawley’ as his descendants proliferated. 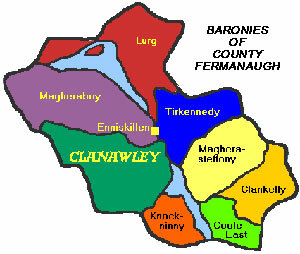 The territory possessed by the McAuleys was a swathe of land in South Fermanagh extending roughly from the present town of Arney south to Swanlinbar. Three different invasion routes into Fermanagh passed through this territory, and the Irish Annals mention several battles against invaders that took place in Clanawley. In 1502 Eamon MacAwley son of Phillip Reagh (see pedigree) was slain defending his territory against a force of O'Reilleys. In 1538 another raid by O'Reilleys burned the 'town of Clanawley'. In 1594 an English force marching to Enniskillen Castle was defeated by a Maguire-led army at a ford near the Arney bridge that was renamed "Ford of Biscuits" after the provisions that were left by the fleeing English army. The MacAwleys of Westmeath ruled Calry, a territory in County Westmeath which British records of the 1500s referred to as McGawley’s Country. The core of this territory is the parish of BallyLoughlowe. They were a branch of the Southern O’Neills, with a pedigree that reaches back to Niall of the Nine Hostages (d. 405 A.D.), who was High King of Ireland and a contemporary of Saint Patrick. (See Appendix 2.) The eponomous ancestor was named "Amhalghaid" an ancient but difficult-to-pronounce Irish personal name. In English this was sometimes spelled 'McAwaley', but more commonly it is 'McGauley' or 'McAuley'. In 1590 Awley McGawley of Ballyloughlowe, claiming to be lord of four castles and towns, petitioned the Queen's Privy Council to surrender his possessions in Westmeath in return for a regrant of these properties to him as well as a knighthood. This could have transformed Awlie from a clan chief to a feudal lord with his clansmen as tenants. This petition was probably resisted by the English authorities and/or other members of the MacAwley clan, including Awlie's own brother William. In 1600 during the Elizabethan wars, the army of Hugh O'Neill of Tyrone was hosted by William MacAwley at his castle at Ballyloughloe. 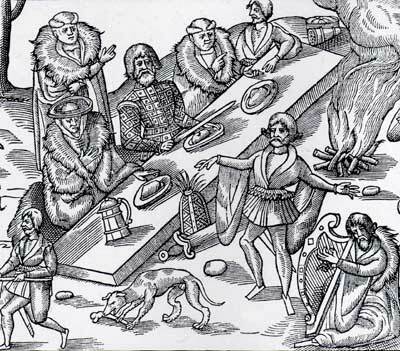 The McGauleys of Westmeath were not entirely dispossessed by the Elizabethan conquest, but most became landless during the turmoil of the 1600s. Many of them went into exile, of whom the most remarkable was Philip Henry Magawley (1675-1756) who fought for James II and became a Jacobite exile to the continent in 1693. Joining the Austrian Army, he rose to the rank of general, and in 1734 was made a Count of the Holy Roman Empire. Although Philip Henry Magawley had no male survivors, he was allowed to pass the title to his nephew Francis and this line continues to the present. Francis's grandson married into the influential Cerati family, creating the line known as the Counts Magawly Cerati di Calry, which served the Austrian Empire in important military and administrative positions. In the 1840s this Austrian title received the "assent" of the British monarchy, so that the Counts Magawli Cerati were able to live in Ireland as gentry. The Counts apparently became Italian citizens after the breakup of the Austrian Empire in 1918, although some female-line descendants are Irish. Another branch of the Counts Magawley became German citizens about 1900, where they were distinguished in military and intellectual pursuits. Their arms are shown in Appendix 2. The best-known member of this clan was Mother Catherine McAuley (1779-1841) daughter of James McGauley (1722?-1783). Born in Dublin, she was orphaned at an early age. Devoting her life to religious service, she founded the Sisters of Mercy. 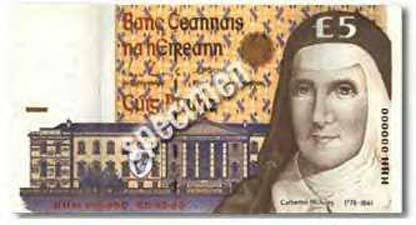 She was pictured on the Irish five-punt note until 2002 when the Euro became the currency of Ireland. The majority of the MacAuleys in Ireland appear to be descended from Scottish settlers, rather than the two indigenous clans mentioned above. The bulk of these settled in Ulster, especially counties Antrim and Donegal. The largest concentration of McAuleys in the world is probably in County Antrim and in the Belfast environs of County Down. Nearly all of these are of Scottish origin although a few are known to be Fermanagh McAuleys. Although the MacAuleys of Ardincaple are known to be associated with Antrim, DNA tests have shown that the Ulster McAuleys are descended from at least five Scottish ancestral families. McAuleys began arriving in the Glens of Antrim in the 1500s, long before the Plantation of Ulster in 1607, with many of them in the service of the McDonnells. 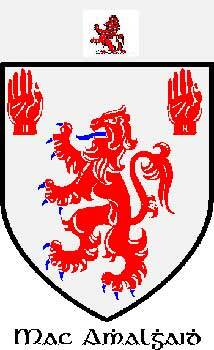 After 1607 large numbers of Scots were encouraged to settle in Ulster to populate the region with loyal citizens. The Antrim McAuley population is divided fairly evenly between Protestants and Catholics, but it is likely that they have common Scottish ancestry, with the Catholics probably descended from MacAulays who settled before the Reformation. Most of the Scotch-Irish McCauleys of America are descended from these Scottish settlers in Ulster, who left Ireland in waves of organized emigration (often organized by Presbyterian ministers) that began about 1715 and continued until the 1780s. Their experience as settlers and fighters in Ireland made them ideal pioneers on the American frontier, where they were able to obtain the land ownership and religious freedom that often eluded them in Ulster. After 1815 emigration to America resumed with even greater force, but later immigrants were more likely to head for urban areas or mining towns. The pedigree of this family is recorded in detail in the Office of the Chief Herald of Ireland, according to Edward MacLysaght, former Chief Herald. I have not seen this detail, but below is a pedigree copied by O'Clery about 1635 from an older manuscript, probably the Book of Ballymote from about 1375. The parish of Ballyloughloe derived that name from a small village of the same name, situated about five miles east and north of Athlone... the people never call the parish Ballyloughloe, but Calree, which was the ancient name of Magawley's country in Westmeath. The name Ballyloughloe seems originally have been that of a castle situated on the bank of a lake called Loch Luatha, and to have been in later ages transferred to the parish. Of this castle only one vault remains, but its site should be marked on the ordinance map. ...I find that local tradition ascribes the erection of it to Magawley, the Irish chief of Calree. ...The hill of Tullymagawley preserves as a 'momumentum aere perennius' the name of the ancient lord of the soil. It was perhaps, the hill on which Mag Amhalghadhe was inaugurated. 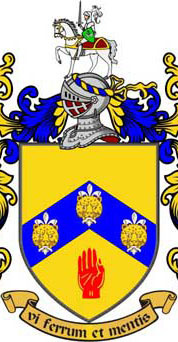 Mag Amhalghadha of Calraighe an chalaidh is of the southern Ui Neill, and descends from Maine progenitor of the men of Teffia. One of the oldest surviving documents of the name McAuley in Antrim was the 1586 pardon granted to Sorley boy MacDonnell and 187 of his followers. Of the 188 names on this document, nine of them were McAuley/McCauley: #127 Bernard McAuley, #149 Donchye Grouma McColla, #150 Alister McDonaghy Grouma McColla, #155 Bernard Boy McAuley, #158 Brian McAuley, #178 Turlough McAuley, #181 Brian McAuley, #182 Gilladuff McAuley, #187 Gillagrouma Roy McAuley. The spellings are as written by an English scribe. It might be significant that two men are listed as "McColla" while seven are "McAuley". "LXXXIX. 1,000 acres. Alexander MacAwley, alias Stewart, hath one thousand acres, called Ballyneagh. Upon this there is built a bawn of lime and stone, seventy feet square, with four flankers, and a stone house in it.
" I find planted and estated upon this land, of British Birth ...[acreages listed, but no names]... Total eleven families, who with their undertenants , are able to make thirty men armed; these have taken the Oath of Supremacy [to the Protestant Episcopal Church]. Here is good tillage, and I saw not one Irish family on the land." This Alexander MacAwley of Durling was a first cousin of Sir Aulay MacAulay, chief of Ardincaple (see below). When Sir Aulay died without heirs, Alexander became the next chief of the MacAulays of Ardincaple, and he sold his Donegal property. In the 1660s the British government levied poll taxes and hearth taxes on the population, and from this a rough ‘census’ of households or adults was made. By far the largest concentration of MacAuleys on the island was in County Antrim, where 51 McAuleys were found. The only other concentrations were in County Fermanagh (Clanawley Barony) with 11 McAuleys and Sligo (Tyrell Barony) with 10. The identity of the 10 McAuly families in County Sligo are a mystery. Perhaps these are fugitives from Donegal or Westmeath or Fermanagh who relocated during the turmoil of the 1640s and 1650s. We know that in the rebellion of 1641 the rebels destroyed most of the plantation settlements of Donegal and that many settlers fled to Sligo. Also, in the 1650s it was Cromwell’s policy (started but not completed) to resettle all Irish Catholics to Connaught province, which would include Sligo. Another possibility is that there was a long-established Irish clan in the area that has been poorly documented. The surname Cawley is very common in Sligo, and perhaps Sligo Cawleys are descended from these 10 McAuly families. From the drawing, the castellated house appears to be a towerhouse castle of the style that was numerous in Ireland in the 1500s, although it might be one of the stockier plantation castles that were built in the first half of the 1600s. This clearly was the stronghold of an important MacAwly . There are no MacAuleys listed for the townland of Agolagh in the hearth tax rolls of the 1660s, and I have not found any further information on Donagh groome McGawly or his towerhouse. Gawley’s Gate (Geata MacAmhlaiobh in Irish Gaelic) is a small town on the southeastern shore of Lough Neagh in County Antrim. Although Gawley’s Gate is at the opposite end of County Antrim from where McAuleys are thickest, it seems likely that the Gawleys who founded this town were McAuleys of Scottish ancestry. It appears that the surname Gawley is used locally rather than McAuley or McGauley. McAuliffe, O’Cally, McCully, and McCollough are different surnames which are occasionally anglicized as McCauley. The name McCollough is very common in Ulster. It is believed these McColloughs are descendants of Scottish settlers, as there were two separate clans of the name in Scotland. The originial name in Gaelic is believed to be Mac Cullach, "son of the boar". In America this name was common among the Scotch-Irish settlers, and in some cases the name may have evolved into McCauley.